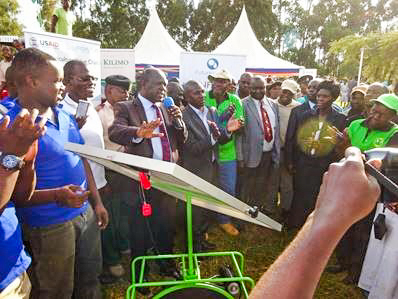 The Governor of Transzoia County officially launches the partnership between Futurepump and Juhudi Kilimo, facilitated by KSSI, to provide credit for SWPs. NAIROBI, KENYA – FEB. 8, 2017 – Winrock International, the U.S.-based national and international economic development organization, Fintrac, and the United States Agency for International Development (USAID), will host a one-day meeting to discuss the potential for solar water pumps, their benefit to farmers and expanding credit access to help farmers purchase the pumps. The USAID-funded Kenya Smallholder Solar irrigation (KSSI) project, implemented by Winrock International, has collaborated with the USAID-funded Kenya Agriculture Value Chain Enterprises (KAVES) project, implemented by Fintrac, to demonstrate solar water pumps to more than 13,000 smallholder farmers. The pumps can significantly increase yields and earnings by increasing irrigated acreage and eliminating diesel fuel costs. Solar water pumps are now in high demand but with a price tag of $350 to $1500, many smallholders need access to credit in order to purchase them. The lack of smallholder credit options has slowed pump sales in Kenya. Winrock’s KSSI project has partnered with Fintrac’s KAVES project to launch three solar pump loan pilots with partner microfinance institutions. But more credit options are needed to ensure that the millions of farmers in Kenya who live on two acres or less have access to solar pumps for irrigation. Winrock’s KSSI project has become a model for adding value to existing USAID-funded projects and has been critical in the effort to expand access to credit. Winrock has also evaluated the quality of products on the market and has helped to match pumps to the specific needs of farmer groups.